Andreas J. Romberg, violinist and composer was born in Vechta, Germany on April 27, 1767 and died in Gotha, Germany on November 10, 1821. He was from a musical family, both his father and uncle were musicians, as was his cousin, cellist Bernhard Heinrich Romberg (1767-1841). In Bonn, Germany in the 1880s, both Andreas and his cousin played in the orchestra of Maximilian of Austria - the orchestra in which Anonín Reicha (1770-1836) played 2nd Flute and Ludwig van Beethoven (1770-1827) played viola. Romberg composed a wide variety of music including 8 Operas, 10 Symphonies and 20 Violin Concertos. 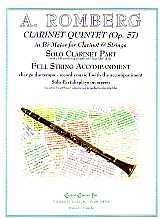 His Chamber Music in addition to one Clarinet Quintet (this one), included 8 Flute Quartets (for Flute and String Trio).